In a characteristically bold move, we decided to split the team from the off on this project, so while hold the team headed far north towards the Syrian border myself, Ed and volunteer Zubear headed to Othman bin Affan Association, a disability centre in Al Zarqa. Going into the centre we weren’t aware of the range of disabilities we would be working with and we knew we would have to adapt our coaching accordingly. We were taken around by the head teacher and she introduced us to all of the children at the school. It was evident there was a range of disabilities there, from autism to down syndrome to a range of physical impairments. We agreed with the teachers that we would train them first to deliver some of the games for the children and then they would deliver the games to the children with out support. With an adapted version of Catching Targets which was made to resemble Goal Ball within a 5 minute demonstration of how the game worked the coaches were coaching each other and feeding back to me how they could adapt and include all their children in this game. It was clear that the teachers really understood and knew their children well. So after discussing our coaching and adapting it so that all children could get involved with hitting the ball and playing catching game with large soft balls we had a short break to go dancing with the children to Middle Eastern music. It was amazing to see the life and spirit in these children and the sheer joy in their faces. 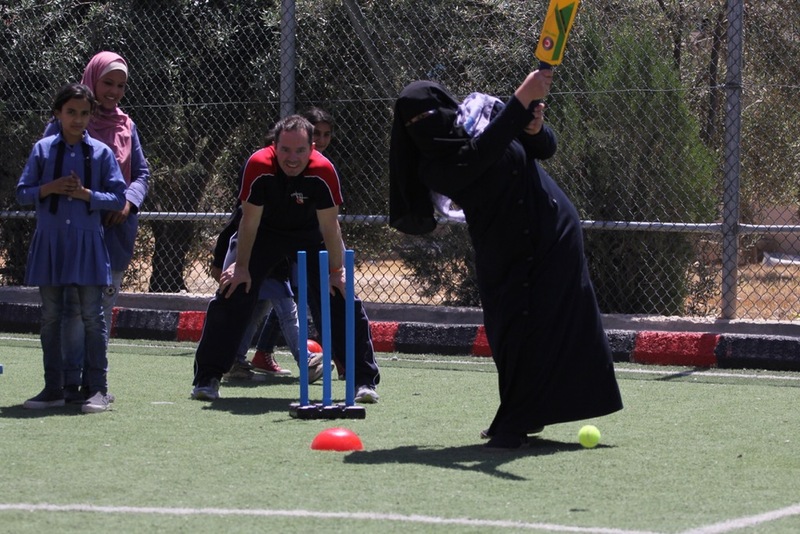 We then went outside play the games and it was clear all the children wanted to hither ball with the cricket bat, and it was also clear the teachers were really enjoying coaching. This was immediately reflected back in how engaged and keen to be involved the children were. The key moment for me was a quote from one of the teachers, which was “this game breaks down the wall between the teacher and the student to understand their children more”. 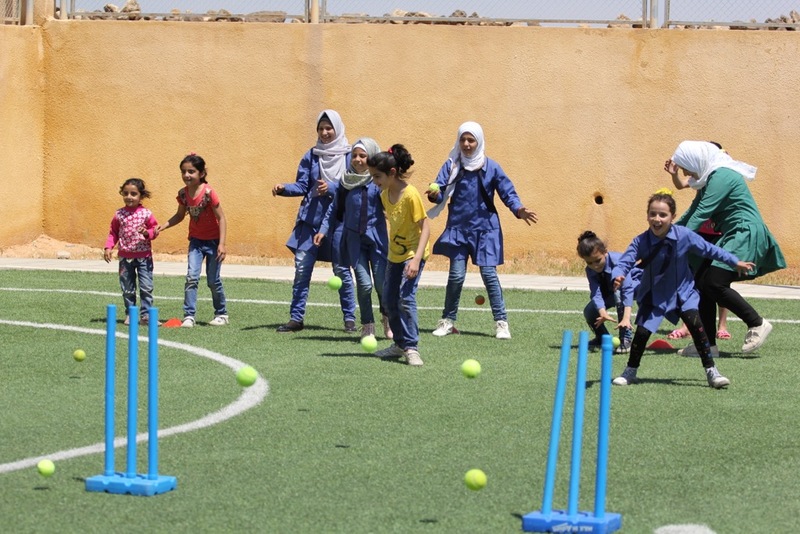 After this session we then saw the Right to Play’s work in a girls school in Al Zarqa, where there was a lot of enthusiasm for play-based learning which is a credit to Right to Play, and interest in getting involved in cricket in the future. The other half of the team headed to Aldafyaneh. As we drove north beyond Mafraq it became clear that we were incredibly close to the Syrian border; between 1 and 4 kilometres in fact, depending on who you asked. At this far-flung outpost we received the warmest of welcomes from the guys from UNHCR, plied with coffee and tea while the woman who ran the centre outlined her hopes that the activity could be used not just look at the issues of refugee integration but also to empower girls in the community who were so often neglected by the few and far between sports programmes that had contact with the area. We made careful plans to make sure the girls got the same opportunity as the boys. 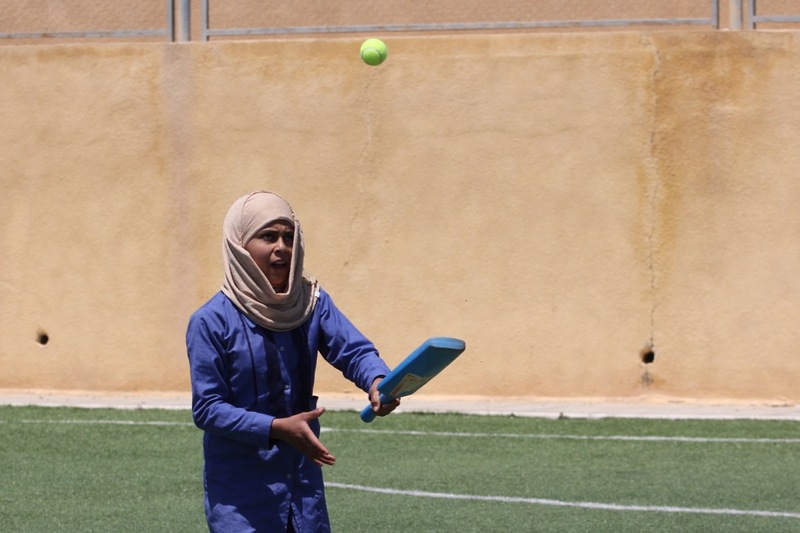 It has been a bit of an adjustment period for me coming from our African projects where boys and girls are allowed to mix in and play together; this is so culturally far off in this conservative part of Jordan that gender equality and empowerment looks very different here – just giving girls the opportunity to play is a massive step. We started with the boys, while the girls sat by and watched with curiosity. An anarchic but enjoyable session ensued; we started off with relays and then had plans to play 3-2-1 Go! And some catching games but it soon became apparent that the excitement of seeing half the group having a go at batting meant that those who were catching were soon sneaking into the line to join 3-2-1 Go despite assurances that they would get to the play the game next. We quickly adapted and set up a second game of 3-2-1 Go to run alongside the first and line management soon became a lot easier, with only a handful of belligerent older boys occasionally causing a bit of chaos. With time up on the boys, Jamie took them off into a classroom to facilitate some discussions about the challenges in this part of Jordan, while myself, Aysha and Lee were able to run the session for the girls. Initially hesitant, the girls soon warmed up to some classic CWB call and response. I have found my favourite Arabic expression already: “JAHAZENE? !” or “ARE YOU READY?!”. We started off running relays, and as the girls relaxed their joy and support for each other was infectious. Soon, they were begging us to play 3-2-1 Go, which they had seen the boys play earlier, so we split them into 2 teams, Team Fantastic and Team Awesome, to play a round. 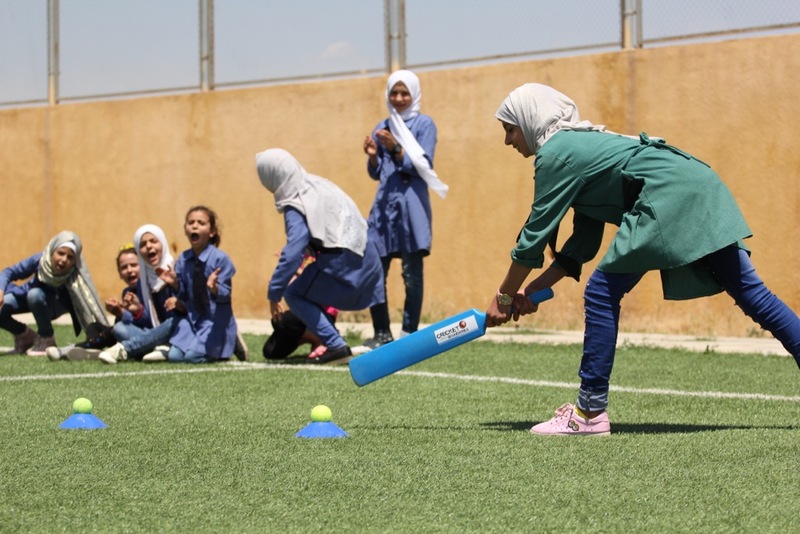 As is so often the case with girls it was a delight to see the bigger girls taking littler ones under their wing, helping them to hold and swing the bat, while the chanting in support of their teammates as they dashed around the stumps rang around the small playing area. The real moment for me, however, was our final 25 minutes in the session. We planned to play a bit of “Ready Steady Throw” and Aysha settled down with a group of girls around her so they could write down their worries which we would soon be knocking down. It was amazing to watch her facilitate this discussion as girl after girl raised their hand to offer a suggestion of what to include of the list. Conducted all in Arabic I, of course, could understand nothing of what was being said but the expression on Aysha’s face told me that this was some powerful stuff. So it proved to be. We set up the stumps and explained the idea to the girls – you throw the ball from the cones to try to knock down the stumps and your worries. What happened next was genuinely unforgettable. “YALLAH! “(go!) I shouted, and instead of throwing the ball the girls simply charged at the whiteboards hurling the ball at them from close range, stamping on them, and using the tennis balls to erase the words written there. They were thoroughly destroyed. The buzz and excitement from the girls at this was palpable, it felt genuinely therapeutic. It wasn’t until that evening that I was able to get a proper sense of what had been written on those whiteboards. Aysha explained that while they had started with their worries, the conversation soon evolved to the things that made them sad and angry. Girls spoke of their hatred of those who had destroyed their families, the jealousy they felt when they saw complete Jordanian families able to support each other while theirs had been ripped apart, how they felt they had to be violent to hold on to their rights despite not wanting to have to resort to this, how they felt ostracised and were shouted at to “go home” in the streets. It was clear that these activities were a powerful way to find out more about the lives of young people. The next step for us must be how we connect these to those with the ability to implement services to help tackle these issues. Having UNHCR on board feels critical for this and I hope that this will help the voice of these young people be heard, so that their needs can be addressed unfiltered by adult perceptions. Awwwww you guys…. sounds like an awesome project. So moving to imagine the scenes when the girls smashed their challenges to bits. So tragic and yet so much hope and enthusiasm and talent!! got shampoo in my eyes now ? ?? ??❤️?? Genuinely moving blog. Keep up the great work team. Powerful stuff as always CWB. Can’t wait to see this new venture grow.